WEST COLUMBIA, S.C. — As he fights for his political life, Gov. Henry McMaster could be getting a big boost on Monday as the two-week sprint to South Carolina’s primary runoff comes to an end. 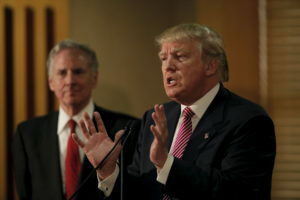 In the final full day of campaigning, President Donald Trump is making a trip to West Columbia to campaign for McMaster’s bid for a first full term in office. The presidential visit comes just hours before voters decide if they want McMaster or businessman John Warren as their GOP nominee for governor. The White House has been throwing everything at its disposal into the race to save McMaster, who went out on a political limb for Trump at a crucial point in the 2016 Republican presidential primaries. McMaster, the lieutenant governor at the time who was seen as an establishment figure, initially backed fellow South Carolinian Lindsey Graham’s short-lived candidacy. After it folded, McMaster has said he fielded calls from many other GOP White House hopefuls before settling on putting his support behind Trump. When voters in South Carolina return to the polls Tuesday, they’ll be deciding in part which is more meaningful: a Trump endorsement, or a candidate who embodies some of Trump’s outsider credentials. While the president has endorsed McMaster, Warren has positioned himself as the candidate who is the choice who more embodies the president himself. Like Trump, he’s made millions in business, able to nearly self-fund his entire campaign. And like Trump, he’s never before been directly involved in politics, spending his time in the private sector. Have Democrats improved their chances of winning back the House?